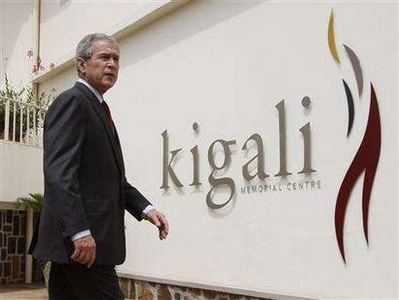 President George W. Bush had a chance to reflect on his Africa policy at the Kigali Memorial Center in Rwanda – the site was built in memory of the 500,000 Tutsi who were massacred in the Rwandan Genocide over the course of 100 days – all this as the world stood by and failed to act. Mr Bush was on a grand 5 country Africa tour – from Benin, to Tanzania, to Rwanda, Ghana and Liberia. This was only his second trip ever – his first trip to Africa was in 2003. Recently the Bush administration, together with other world governments and the UN, have come under heavy criticism for their policies towards the Genocide in Darfur, Sudan. The current administration has ineffectively pushed for sanctions, coupled with some humanitarian aid to combat Sudan’s role – and has defended its policies towards Africa by citing efforts to end Kenya’s bloody political crisis to the war on HIV/AIDS. The Darfur issue dwarfs Bush’s accomplishments in Africa – which have somewhat been a positive island in an otherwise roller-coaster foreign policy. The administration’s accomplishments include the Millennium Challenge Corp, which provides funding to countries that adhere to democratic principles and sound economic policies; to investing $15 billion over five years to fund the President’s Emergency Plan for AIDS Relief, or PEPFAR; to investing $1.2bn for a five-year campaign to lower malaria deaths in Africa. One thing is clear – Mr. Bush’s trip highlights how eager the people are for a more proactive US policy towards Africa as posters for Obama08 greeted the president, first in Tanzania, then all throughout his trip wherever he went.